The day was overcast and a light drizzle was falling as I made my way through the West Gate of the town of Clonmel, one of the few remaining portions of the old town walls. These walls had held Oliver Cromwell at bay as he laid siege to the town with eight thousand men. For several bloody weeks in 1650 two thousand defenders held the foe at bay inflicting heavy casualties. Cromwell, a name which will forever live in infamy in Ireland, eventually negotiated a surrender with the Mayor John White, agreeing that neither the citizens nor their property would be harmed. The terms of the surrender were upheld which was in stark contrast to the bloody mayhem typical of Cromwell’s military campaign in Ireland. Forty years later, William of Orange passed these walls unimpeded on his march to Limerick as he put down the Jacobite rebellion after seizing the crown from Catholic King James II. The town of Clonmel was founded in 1209 and it was here that I grew up. I had not been back to my hometown since I had become a Mason and on this overcast day I was making my way through the town to visit a Masonic Lodge I had not even known was there. I had emailed the Grand Lodge of Ireland to learn if there was a lodge close to Clonmel that I might visit during my trip. To my great surprise they had told me there was one right there, in my town and they gave me the name and contact information of the Lodge Secretary. We had emailed back and forth over the preceding months and finally the appointed day had arrived. I turned right onto Nelson street and made my way past the handsome Georgian town homes that marked the character of this area of the town. I had the address and thought I knew where I was going but when I arrived all confidence fled me. There was no sign of a Masonic Lodge to be found. No square and compass anywhere to be seen. No sign indicating that a lodge of Craftsman could be found here. I walked a little further down the street in search of some sign but none being found returned to the address I had written down. 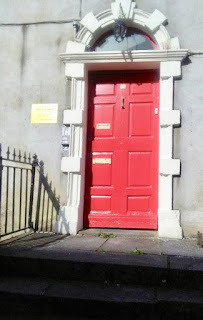 I headed up the steps to the bright red door and rang the bell. 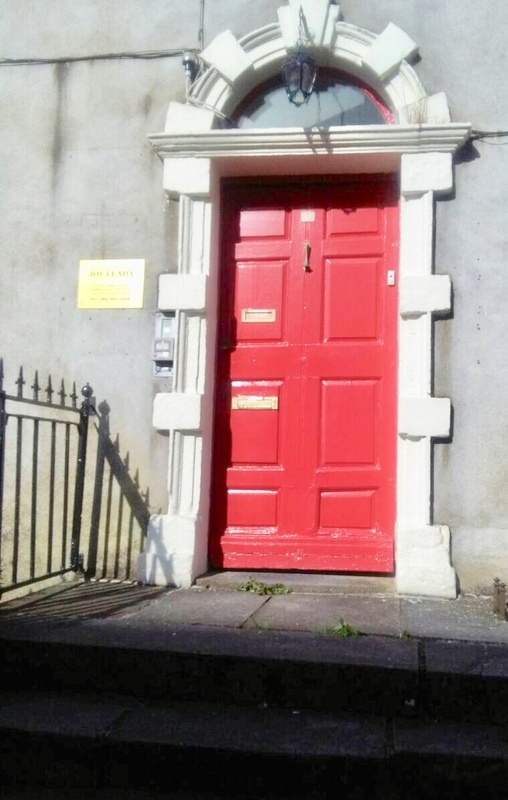 The small brass plaque to the left of the door told me that it belonged to an accounting firm and as it opened I began running through the apology I would make in my mind. The door opened and to my great relief there stood Bro. Secretary. He ushered me inside and closed the door directing me to a set of stairs to the left. We took those stairs down to the basement and he explained to me that his Lodge, Donoughmore Lodge # 44, had been constituted in 1845 and had originally owned the old three-story Georgian building we were in. Over time, membership had declined and along with it the financial condition of the Lodge and they had to sell it. It had been purchased by the accounting firm, the name I saw on the brass plaque outside. The accounting firm treated the Lodge well and had allowed them to move their lodge room to the basement of the building. The Lodge room itself was a small space, the walls covered with the history of these Brothers. One row of wooden benches ran along each of the walls from the West to the East. The room would have been bursting at the seams with twenty Brothers in attendance. We chatted in the Lodge room for well over an hour comparing my experience of Freemasonry in the US to his in Ireland. I asked him why there was no sign outside indicating that a Lodge met at this place. He told me that this was typical of Lodges especially in the south of Ireland. The reason, he went on to say, was that it wasn’t always safe to be a Freemason in the mostly Catholic Republic. This is because of a perception by the general public, not only in Ireland but in the UK as well that Freemasonry is connected with Orangeism. In fact, he attributed this, in part, to the change in circumstances for his Lodge. There was a time when the Lodge was able to publicize their good works and announce their charitable activities through the local newspaper. That was until fifteen years or so ago when several of the key papermen had retired and been replaced by staunch Catholics, with the new editor being a Knight of Columbanus. The Knights of Columbanus was founded in Belfast in 1915 and are not to be confused with the Knights of Columbus which was founded in New Haven CT in 1882. Both orders are similar in that they are male only fraternal orders that require members to be Catholics and share a stated aim of propagating the Catholic faith. The consequence of these new appointments was that Donoughmore #44 now found themselves struggling to get their activities and significant charitable endeavors in print. What struck me most about our conversation however was that Freemasonry was somehow conflated with the Orange Order. I had grown up in Ireland and was very aware of the Orange Order and the sectarian violence that often surrounded their activities in the North of the country. I had never considered them the same as Freemasonry but if such a connection existed in the minds of the Irish then it was no surprise that it wasn’t always safe to be a Freemason in the heavily Republican south. To understand why this is so it is necessary to explain the history of the Orange Order. The Loyal Orange Institution, or Orange Order as it is more commonly known was founded in County Armagh in 1795. At this time the population of Armagh was evenly split between Catholics and Protestants and sectarian violence was commonplace and carried out by gangs organized to promote the interests of both communities. Most of the contention revolved around the leasing of limited farm land, the competition over which was fierce. These gangs eventually coalesced into The Defenders on the Catholic side and The Peep-o-Day Boys on the protestant side. In September of 1795, at a place called Loughgall, these two gangs met at the Diamond crossroads and commenced battle. This skirmish was to become known as The Battle of the Diamond and after fierce fighting the Peep-o-Day boys proved victorious. Following the fight, the Peep-o-Day boys marched into Loughgall and there founded the Orange Order. Named for the previously mentioned William of Orange, the Dutchman who had wrested the English throne from the Catholic King James, the Orange Order had set itself the aims of defending the Protestant ascendancy, supporting the crown so long as it assured the Protestant ascendancy and more immediately in 1795, driving Catholics out of Armagh. Emboldened by their victory over the defenders they set about this task in earnest and two months later approximately seven thousand Catholics had been violently driven from their homes and their property and lands illegally seized. With a history like this it is no wonder that the Orange Order is viewed with disdain in by the Catholic population in Ireland. But this doesn’t explain how the Orange Order became associated with Freemasonry. At the Diamond crossroads, the site of the Battle of the Diamond, there was an inn owned by a man named Dan Winters. Dan Winters was a Freemason and had appealed to his lodge for help when his Inn was threatened by the Defenders. The Lodge, adhering to the non-sectarian principles that are one of the crown jewels of the order did not assist and the Defenders attacked and burned the inn to the ground. Angry at the perceived failure of his Masonic Lodge, he withdrew his membership and along with several other men founded the Orange Order. The Order was modeled, as so many others have been, on Masonic lines. The Orange Order boasts three degrees, the members wear regalia, although instead of the pure and spotless apron of a Mason, Orangemen wear an Orange Sash. The Order is organized into the local Lodges with the associated grips and words. In addition to these outward similarities, K.C. Jack in his article “The Masonic and Orange Orders” appearing in issue 39 of the Ashlar, tells us that the 19th Century in Ireland saw an upswing of anti-Catholic fervor that Masonic Lodges were not immune from. Citing the numerous Papal bulls that condemn Freemasonry and forbid Catholics to become members of the Craft, Jack tells us that these conditions resulted in the Masonic Fraternity taking on a decidedly protestant aspect in the minds of the public. Several mainly Protestant Lodges in the North went so far as to expel Catholic members and thereafter only allow affirmed Protestants to join. These actions were taken at the local lodge level and not endorsed at the Grand Lodge level. The fact of the matter is that Freemasonry and the Orange Order are no more connected than Freemasonry and the Elks, or the Moose, or the Odd Fellows. These fraternities have followed after the Masonic model as the oldest and most successful paradigm of Fraternalism that exists. Just as men can be members of the Masonic Lodge and an Elk’s Lodge, so too can a man be a Freemason and an Orangeman. But beyond this and the cosmetic similarity discussed earlier, Freemasonry and Orangeism are chalk and cheese. One promotes the universal Brotherhood of man for the betterment of all mankind and advances a beautiful system of morality to achieve that end, while the other promotes militant Loyalism and maintains deep connections with Loyalist paramilitary groups with whom they promote sectarian violence. For proof of this, one need look no further than the Orange Marches which pass unnecessarily through Catholic areas of Northern Ireland. These marches more often than not lead to violence. I left Donoughmore Lodge that day with a happy heart for there, I found my Brothers in the Craft just as I would here in the US. We shared a common bond, a common purpose. We met on the level and we parted on the square. One a Protestant, the other a Catholic. Both Brothers. WB Martin O'Brien is a Past Master of Cuyahoga Falls Lodge #735 now Star Lodge #187 in Cuyahoga Falls Ohio. He is a member of Cuyahoga Falls Chapter #225 Royal Arch Masons, Cuyahoga Falls Council #144 Royal & Select Masters and a 32° Scottish Rite Mason in the Valley of Akron NMJ. My wife is from Dublin and she was quite shocked when, after being married for a year, I expressed my interest in becoming a Freemason. She brought up the Orange Order and from photographs alone I could see how they might look related. The Orange Order members are often photographed wearing regalia that looks alot like those of Freemasonry. After a little over a year of researching, I was able to convince her that the two were not related and I was Raised in 1995. Twenty three years in, we are very much a Masonic family, she a member of Eastern Star & Daughters of the Nile, our son a Senior DeMolay and myself, well, my fingers will cramp up if I list everything I am a member of!